David Cameron yesterday met residents and businesspeople in Upton-upon-Severn - one of the towns most severely affected by the recent floods. The Conservative leader said his visit to Upton-upon-Severn in Worcestershire, which was entirely surrounded by water at the height of the flooding, had thrown up important issues which he would press the Government about. He said: "The rainfall was so severe that there were inevitably going to be floods, but there is a sense of frustration among people here about the issue of flood barriers - people feel they could have been kept closer to the town, which would have saved time. "We need to make sure that in future we get better co-ordination between all the agencies involved in the rescue effort." Following a question and answer session with local residents, Mr Cameron said he would ask the Government what could be done to ease the pressure on farmers and businesses who had lost revenue as a result of the flooding. And he said the issue of flooding victims without insurance must be addressed. 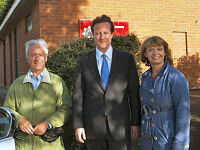 David was joined by Sir Michael Spicer MP and Harriet Baldwin, PPC.